This seafood pancake originates from Busan in South Korea. A filling and easy-to-make snack, haemul pajeon is an all-time Korean favourite. It is made from a combination of seafood, usually mussels, shrimps, oysters,clams, squid and flour. It is an all-time Korean favourite and it has become a signature food for rainy days. It gained international popularity when the Korean First Lady, Kim Yoon-Ok, cooked it for American veterans of the Korean War and their families in the US as a way for them to taste a sweeter and positive side of Korea.Mix batter thinly for a crisper texture and drain water from wet ingredients to avoid sogginess. For vegans, the seafood can be removed to make a healthy vegetarian snack. Most people eat it with Makgeolli (rice beer). It can also be served with Miso soup or Kimchi for a hearty meal. 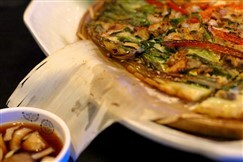 Invite friends for an amazing afternoon with delicious Haemul pajeon and drinks. 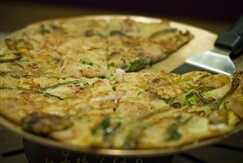 Right from the griddle, hot and crispy, haemul pajeon is the stuff of dreams. Dipped in the soy/vinegar sauce and washed down with some ice-cold makgeolli, it's perfect for dinner, anju, or really any time of day. Just please don't call it Korean pizza.